The Battle for Nava is over, as indeed is the Campaign in Russia with a French Victory. With only 2 hours of daylight left, I hastened my attack to clear the woods of the enemy. If the Russians stood and picked up the fight tomorrow, Marshal Davout would be in a better position to renew his attack if he knew these woods were in his hands and could therefore mask his left flank. The village of Nava now had about 1/3 of it on fire, the flames having lept the river and set a light one of the built up areas on the Russian side of the bridge. Davout's attack on the right was being ground down by the Russians and word was that he was very surprised he had not yet cleared the redoubts. But we all know how stubborn these Russians can be. Especially with lots and lots of artillery supporting them. I had a feeling Davout was going to do something dramatic to shift the balance before nightfall. It was 1700hrs. Light was fading fast. The Russians had pulled back into the top half of the woods. I suspected they were reinforcing but I could not see them. I commanded the Royal Regiment to form line and deploy next to each other, thereby presenting a long line of solid well trained troops ready to volley fire. 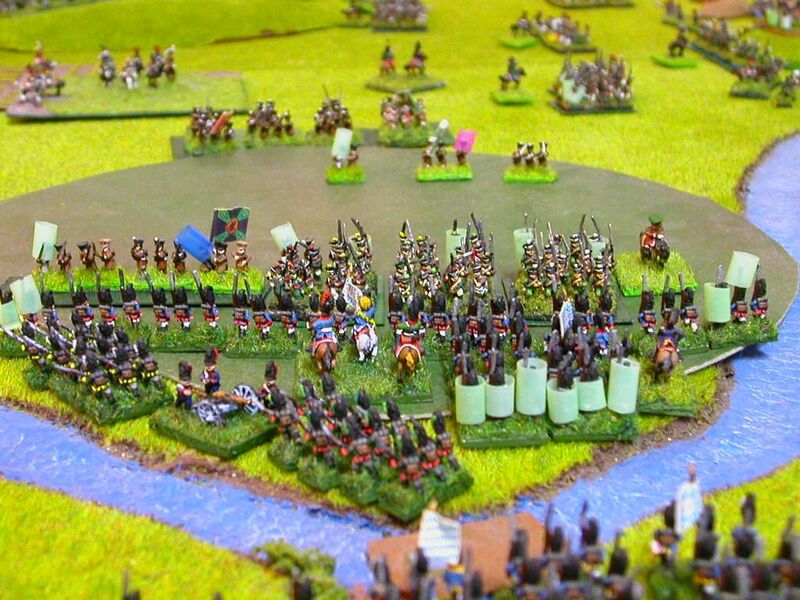 Behind them I positioned the 2nd Regiment in column on the right and then ordered the 2 light battalions and a battery of 6 guns to move up on the left edge of the woods to a position to the left of the line. I thought about relocating my artillery but realised they were probably at the maximum distance that they should be from me and my command. I left them as is. The Russians in front of me. 6 fresh battalions in column and a Jager battalion in line. No sooner had I finished this, when a fresh brigade of Russian troops, 6 battalions emerged in front of us and initiated a firefight with the Royal Regiment. A 7th Russian battalion of Jager that had previously been mauled by my Bavarians emerged on the left of the columns in line and joined in the firefight. Luckily my artillery on both sides of the woods spotted the movement and caused some nasty casualties along with my troops right in front of me. To my joy, the Russians were pushed back with heavy losses. It appeared they lost around 300 men while my Royal Regiment lost 120 men. My men stood firm and awaited any renewed attack. My troops looked at me awaiting an order to counterattack. I held back. I knew any forward movement of my lines would reduce them to mobs in this type of terrain. The Russians are pushed back! I ordered the 2 light battalions on the left, still in column, to join together and charge the tired Russian Jager battalion in line. The shock of the impact and ferocity of the combat resulted it in fleeing from the woods. 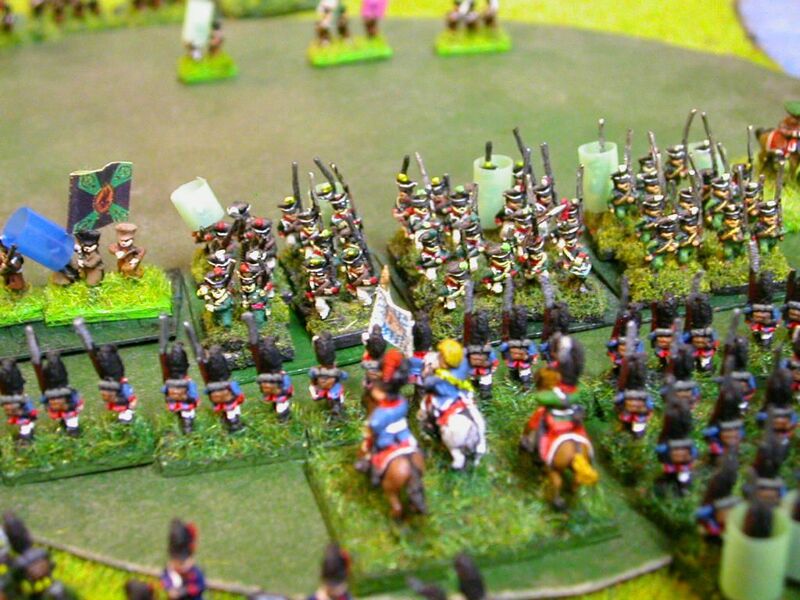 The 2 light battalions then positioned themselves to threaten the Russian column, now seen reforming to charge again. Behind the light battalions that had just succeeded on the left, I ordered the 2 battalions in column on the right to follow behind the lights. At this point something strange happened. Out of the 6 fresh battalions of Russians that had just attacked my line, 2 of them on the left held in place by my light battalion, stayed in position while the other 4 turned and proceeded to move out of the woods. All directly in front of me! I was astounded. Obviously the breakthrough I had predicted Davout to make was placing pressure on the Russians immediately behind the woods. Success by Davout behind the woods, removes enemy from my position. Now was my time to capitalise on our successes. I moved my lines up along with my 2 light battalions and the 2nd Regiment of Line on the left. I was now in the Russian half of the woods and it gave me room to bring another brigade of Bavarians across the ford with its artillery behind me and into the woods. Bavarian success in the woods. It was now quite dark. It was at this point that disaster struck the Bavarians. I was shot! Very badly too! As I was removed from the field, my entire command lost its nerve and the everyone in the woods began streaming back over the ford. The word went out. "The Crown Prince of Bavaria" was dead! The Crown Prince of Bavaria moments before he was shot dead. On the right flank, Davout was having limited success. He had been charged by a large formation of Russian horse on the extreme right and the French horse were having a bad time of it. The situation with Marshal Davout on the right. An elite brigade breaches the Russian lines in the centre of the photo. Davout had been holding a fresh elite brigade of infantry in reserve just for this moment. He launched it in between the 2 main redoubts and after taking moderate casualties managed to get in behind the redoubts and force the surrender of a Jager battalion and 2 batteries of artillery. It was now in front of a 2nd line of Russians and their guns. Davout was deterred and pressed on. At this point, the Russians were observed withdrawing and Davout decided not to pursue due to the darkness crowding in very fast. He knew bandits and cossacks would be out in force once night falls. Better to advance tomorrow after a good nights rest and pick up their trail. During the night as Davout was sending word to Napoleon of his success, an ADC arrived from the Emperor notifying the Marshal the Russians had surrendered outside of Moscow. As a strong French armies were bearing down on both Moscow and St Petersburg, both which were only lightly defended, Tzar Alexander of Russia admitted defeat in person as he presented himself to Napoleon the next day. The campaign for Russia is over! Stay tuned for the next Campaign set in 1809.
i did not present myself thank you very much i was busily fleeing south with the imperial guard,mmm i don't know if that is any better. but i am now sunny myself by the black sea plotting my revenge.